The captain of the crashed AirAsia jet was out of his seat right before the plane plunged into the sea, conducting an “unusual” procedure when his co-pilot apparently lost control, making it too late to save the plane by the time he returned. Two people close to the investigation told Reuters that it was the Indonesian captain Iriyanto who tried to cope with maintenance problems on the Flight Augmentation Computer (FAC), rather than his French co-pilot Remy Plesel, who was less experienced, while flying the plane in turbulent weather conditions. The Airbus A320 jet, that lost contact with air traffic control during a flight between Surabaya, Indonesia and Singapore on December 28, had reportedly been suffering from key computer faults for over a week. FAC is responsible for the rudder control, safety limits in particular, and when its power is cut, pilots turn to manual control. After failing to reset the device, the AirAsia pilots switched it off, which was followed by a steep climb of the plane before its stalling and plunging into the Java Sea, Bloomberg News reported Friday. The circuit breakers are located on a wall panel behind the co-pilot, so, according to diagrams of the cockpit, it is impossible to reach them while seated on the captain’s place. “The co-pilot pulled the plane up, and by the time the captain regained the controls it was too late,” one of the people familiar with the investigation said, as cited by Reuters. AirAsia refused to comment, as the matter was still under investigation by the National Transportation Safety Committee (NTSC). Indonesian officials also stressed that it is too early to make any well-grounded conclusions, and the accident needs further analysis. 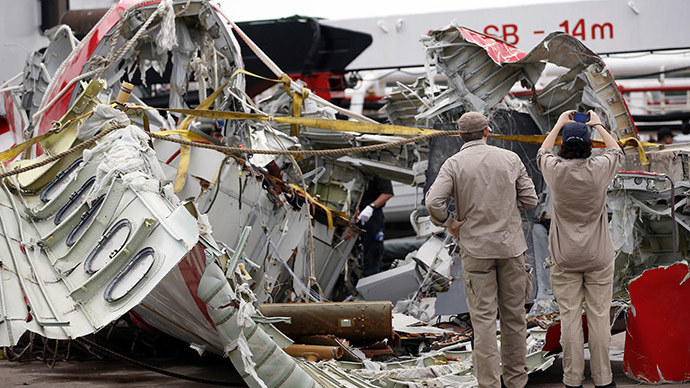 On Wednesday, Indonesia submitted its preliminary, “purely factual” report on the crash to the International Civil Aviation Organization (ICAO), without making it public, Reuters reported. Out of 162 people on board, only 70 bodies were found by a multinational search and recovery operation, which was hampered by rough weather and strong waves that led to poor underwater visibility.